Garmont's new Cosmos delivers a perhaps unprecedented combination of skiing and touring performance, at a marvelously low weight. 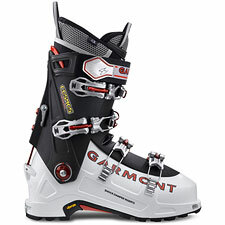 I'll admit it: where Alpine Touring ski boots are concerned, I've long considered myself a Garmont man. Their shells have always seemed the most Lange-ish to me, in terms of fit and feel, which remains my gold standard for downhill skiing performance. Garmont created arguably one of the very best early-generation touring boots in the old Mega Ride, which ruled the roost in its day for its combination of up-and-down performance. Since the Mega Ride, however, Garmont has veered toward heavier, Freeride-oriented boots like the Radium, leaving room for other makers like Scarpa and Dynafit to claim the pure Alpine Touring category as their own. No more. Garmont is back, and with the Cosmos, they have given us a perfectly modernized Mega Ride—quite simply, it's the best A/T boot I've ever skied. The key to understanding the Cosmos is to place it beside its relatives, the Mega Ride and the Radium. The Mega Ride was a great boot in its day—light, an agile climber—but it was also hopelessly soft, especially for heavier riders. The Radium remains a sleek and stiff downhill performer, but it's simply too stiff for long-haul touring and climbing comfort. At last, the Cosmos gives us a true fusion of these polar opposites: climbing comfort and downhill performance. I remember the moment I first tried on the Cosmos. Standing in my living room, I decided to put a Cosmos on one foot, and my current A/T boot on the other foot. The Cosmos was so much stiffer my first thought was that I'd forgotten to switch my boot out of Walk Mode. But stiffness alone doesn't necessarily translate into great on-the-snow feel. To me, the Cosmos smooths out the twitchiness of the Radium, blending stiffness with a predictable, progressive ride that proved so credible I began skiing the Cosmos extensively in-bounds at Mammoth Mountain—my Alpine gear often stayed at home. Just to clarify: I'm picky! I have never until now been satisfied enough with the feel of an A/T boot to actually be willing to hard-charge it, all day long, at a resort. Climbing performance is outstanding. Unlike the wraparound-cuff Radium, the Cosmos is a cabrio (hinged-tongue) boot. It releases in Walk Mode as if you've just pulled the whole skeleton out of the boot, providing great and effortless range of motion. And it's light: six pounds, six ounces per pair measured in a size 26.5, including stock liners and laces. Drop the laces and the metal buckle guard clips and you'll save two additional ounces. Note that Garmont has effectively fixed the toe box fit problems of its past models. Given my years of smashed toes in Garmont boots, I was skeptical that I'd fit into a 26.5 Cosmos shell, but Garmont truly has expanded the fit in the toe. I was able to ski and climb without toe pain, and I was even able to hike downhill—remarkable for a 296mm shell. Fit otherwise is typical of Garmont, favoring a low-to-medium volume foot. In case it's not obvious by now, this boot absolutely delighted me. I reserve my highest rating for gear which I like so much I'm willing to buy it with my own money regardless of what I'm currently using. The Cosmos easily rises to that standard. This is exactly what I want from an Alpine Touring boot—highly recommended. note: for thoughts on Cosmos tech fitting issues, see my Cosmos Update.